I don’t write much anymore. You might have noticed. Every time I start on a post, a year and a half of uncertainty about employment and family rises up and stifles me. You don’t even want to know how long this paragraph took. And it’s not even a paragraph. Paragraphs need five sentences. Okay, now it’s a paragraph. So I’m trying something new. “Dailies” is the perfume equivalent of those daily outfit posts on fashion blogs. I’ll do different categories each day (daily book, daily nail polish, daily Calming Manatee…), with perfume always at the center. Please feel free to share your own dailies (and to use your own categories)! Daily Fragrance: Frederic Malle En Passant. Today’s particularly gross weather demanded one of my freshest, most delicate perfumes. 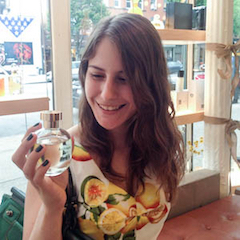 This photorealistic lilac fragrance is my latest favorite from my Perfume Messiah, Olivia Giacobetti. Daily Lipstick: Bobbi Brown Creamy Lip Color Hibiscus. Worthy of its creamy title. It looks so bright in the tube, but it’s really a ballet slippers pink. Daily Tea: Kusmi Almond Green Tea. Drinkable Jour de Fete! An absolute must-try for lovers of almond or heliotrope fragrances. Disclaimer: This post does not contain affiliate links. I purchased all of the products listed in this post, much to my wallet’s dismay. I have a pack of Kasumi Label Imperial on my desk right now, along with a set of 5 mini taster tins. Funny you should put it up today. Daily fragrance: Lyric Man which I found charming and casual, extremely wearable. Tonight my lips were coloured with Ben Nye dark plum pencil and Shu Uemura gold glitter eyeshadow, yes I looked superfine. Portia, the day they stopped selling Shu Uemura in the US was one of the worst days of my life. Did you read that Karl Lagerfeld’s gorgeous cat (almost as adorable as Zelda!) is going to be the face of their holiday collection? NO WAY! To both those facts. A life without Shu Uemura is a life half lived. I will bring you some in November when I’m in New York. Karl Lagerfeld’s cat will be the face of Shu Uemura? How does that even begin to happen? I’ve never heard of Kusmi Tea before now. I guess I need to check it out. Tea of the day was black Assam brewed with ginger root, cloves, cinnamon, cardamom and star anise for a homemade chai. Scent of the day Hermes Un Jardin en Mediterranee, because I need something easy to wear in this unusually muggy weather. Lip of the day Neutrogena SPF 15 lip balm. Boring. I’m with you Ari, I miss Shu Uemura a lot. I usually give my DH a shopping list when he travels to Tokyo for business. Your homemade chai sounds fantastic! Luckyscent carries some of the Kusmi line, and now that I’ve tried a few, I can see why- they’re so wonderfully fragrant. Don’t you dare stop writing! You are one of my favorite bloggers ever. I enjoy every post and these new dailies seem fun. I don’t have any dailies to share yet because it takes me forever to wake up and get going – coffee, not tea, in the am for me. Thank you so much for this sweet comment, Kate! I desperately miss coffee- lately it makes me shake like an overexcited chihuahua. I BEEN MISSIN U. Glad you will be posting more regularly. Smooches. My dailies: Scent is DSH Pink Gardenia, from a sample. There’s no coconut listed in the notes, but I swear it’s there… along with a ton of Dawn’s sweet musk base. I smell beachy. Lipstick is Revlon Just Bitten Lipstain in Romantic, a sheer red crayony thing that is much more kind to my lips than your usual lipstain formula. Drinking iced decaf coffee with Caramel Vanilla creamer. Smooches back!! I think of you and Bookworm all the time. Pink Gardenia sounds very pretty! The only DSHs I have tried are Cafe Noir, which I did not like, and Pretty & Pink, which I was shocked to love. I’m happy to see a post from you. Dailies seem like a nice little distraction. I have never tried Kusmi teas but I bought a gift set of them for my niece for her birthday last year. Someone recommended them. How did I not know En Passant was lilac? I must have had it confused with something else in my mind. I love lilac. I’m drinking Stash Strawberry Pomegranate tea. My perfume has long since disappeared and so has my lipstick. I’m doing laundry so no need to refresh them at the moment. Thank you so much for the good feedback on the Dailies idea, Poodle! If you love lilacs, you NEED to try En Passant. It’s my #1 lilac, although I hear that the Pacifica French Lilac is also a very good budget option. I hadn’t heard of Stash before- I see a salted caramel mate on their website! My mind is blown. Please keep blogging! And get Karl’s cat to get Shu back to the states. Thank you for the encouragement, Katherine! I’ll have Zelda’s people call Choupette’s people. Great to see a post — dailies is a great idea (or peeks in the purse or newest hat or dress), no paragraphs required. Always see or learn something new and fun from you — today it was the Calming Manatees. It’s hot today, so no lip colour (it all melts), fragrance is the very refreshing L’Occitane The Vert, drinking some coconut water (yes to potassium). Isn’t Calming Manatee great? I got to pet a manatee in Florida when I was eight, it was almost definitely the high point of my life. My dailies are: Penhaligon’s Juniper Sling (yayyyy! I’ve finally bought it!!!) for fragrance, Revlon ColorBurst matte balm in Shameless for lipcolour and YogiTea Choco for drinking. “Gincredible” is so funny and true 🙂 I like it! You have taught me something I didn’t know about paragraph length, for which I thank you. 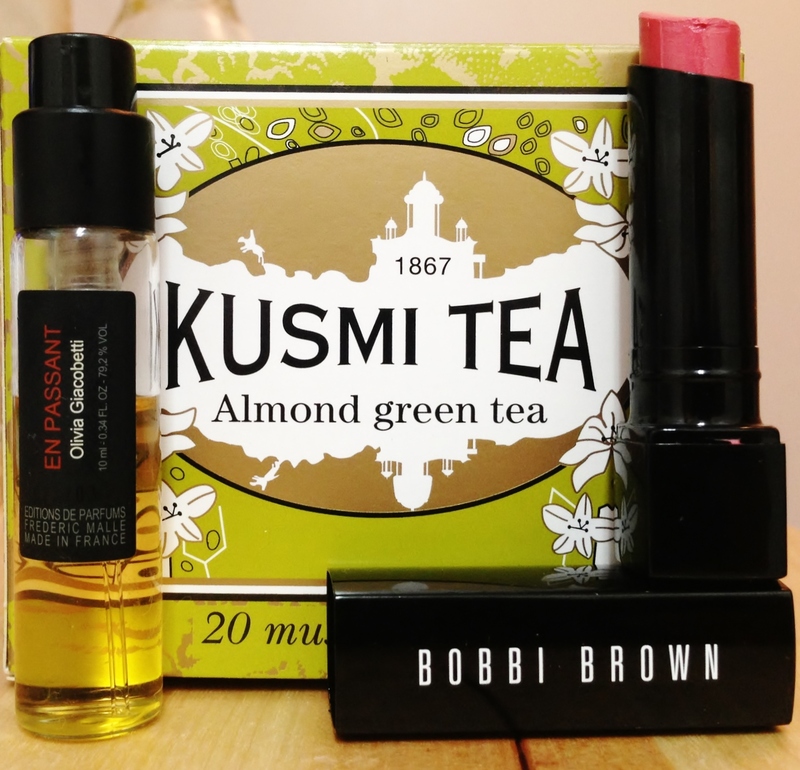 I did know about Kusmi tea, thanks to Andreea of MyBeautyBlog, who sent me some. But I wouldn’t have done otherwise, being quite plebeian in my tea tastes. I love these dailies! They are such a wonderful idea!